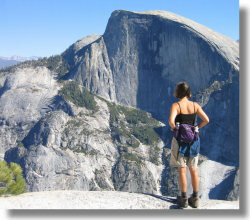 Why Hike to North Dome? You haven't really seen Half Dome (figuratively, at least) until you've stood on North Dome and looked across Yosemite Valley at it. It's an incredible closeup view. North Dome also offers an unsurpassed view of Clouds Rest, a peak that tends to get obscured by scene-stealing Half Dome when you're sightseeing from Glacier Point or Yosemite Valley. Best Time to Visit: whenever Tioga Road is open - roughly June to November. You'll have a few springs to ford if you hike to North Dome early in the summer. Crowd Factor: Not a lot of people hike this trail, but since it's an uneventful (by Yosemite standards) first four miles with a spectacular destination, what hikers there are tend to pile up on North Dome itself and linger there. You'll find the North Dome vistas difficult to tear yourself away from. Scenery Factor: Much of the route to North Dome is your standard walk in the woods, but there's a big finish. The approach to North Dome, and North Dome itself, offer spectacular views looking across the valley to Half Dome and Clouds Rest and down to Yosemite Valley itself. If you're a fan of things with holes in them, don't miss the 0.6-mile detour to the Indian Rock Arch, a natural granite arch about 15 feet (5 meters) high. If you're only mildly curious, you can spot it from the North Dome trail on the return trip instead. Difficulty: Medium high - a 6 out of 10. It's a longish hike at a higher elevation than you're probably coming from, and there are a few hills to go over en route. It's not dangerous, though, unless you wander too close to the dropoffs at North Dome itself. Getting There: Parking is at the Porcupine Creek (not to be confused with Porcupine Flat, a mile to the west) lot on Tioga Road. From Yosemite Valley, follow the signs to Highway 120. Ten miles (16 km) after leaving the valley, turn right at Crane Flat, then proceed 25.5 miles (40.8 km) east on Tioga Road to the Porcupine Creek lot. If you're entering Yosemite from the east, Porcupine Creek is 22 miles (35 km) west of the entrance gate on Tioga Road. Here's a Google Street View panorama of the trailhead parking area. Trail Notes & Hazards: Although there's a small net loss of elevation on the way to North Dome, you'll face plenty of ups and downs in between. Make sure that either you or your bearers are in good shape. North Dome itself is rounded on top, as you'd expect from a well-behaved dome, but if you walk close enough to the edges, you'll still find sheer dropoffs to Yosemite Valley (or Tenaya Canyon, depending on which side of North Dome you fall off) a few thousand feet below, so please be cautious, and keep a close eye on any absentminded friends. You may also find cause to tie down your hat when you're on the dome.